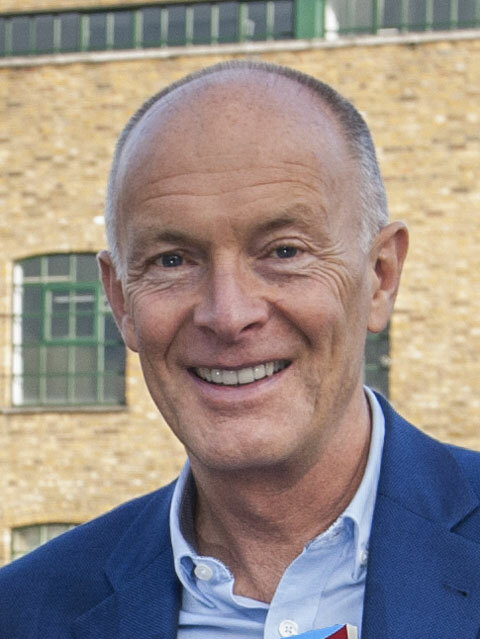 This David Parrish interview by Culture Matters on the subject of culture, creativity and business was published online in eight languages. Culture Matters is a joint initiative by Platfor.ma and the EU-EaP Culture and Creativity Programme. David Parrish, one of the world’s leading experts in field of development of cultural and creative industries, talked about why cultural institutions need strategic planning, why it stirs strong emotions at times, and how to combine creativity and a business approach. — My experience of work in the cultural sector shows that the majority of people from the cultural and creative fields are passionate about creativity and art, but lack an understanding of business processes. They are apprehensive of business, believing that business and art are on opposite sides of the barricade, or that learning about business tools would have a negative impact on their cultural mission. I understand these concerns, but they get in the way of cultural institutions achieving results. Completely rejecting learning about business technologies leads to throwing the baby out with the bathwater. Therefore, I try to help people from cultural industries to begin using business tools that correspond to their values and goals. Not just reproduce them but also adapt them to their goals and objectives. We want cultural organisations to achieve greater success and have a more lasting influence, and that is precisely why it is so important to formulate your mission, goals and vision of success. With my cultural background, I decided to enrol at the Bradford University School of Management as a “spy” on behalf of culture in order to understand the actions of businessmen, adopt their tools and adapt them for the cultural sphere. We are behind the wheel. It is we who decide how and which tools to use. A hammer may be used as a tool to kill or to build a shelter. We can’t blame the hammer for committing a crime, just as we can’t blame a strategy, finance or marketing for all the evil there is . But we can use tools to achieve our goals. — In other words, people from the cultural sector have to understand that strategy is a roadmap of sorts, and not merely a piece of paper with some metaphorical phrases, right? So I said: “Okay. Can I propose a ’development plan’?” “Oh, yes. That’s exactly what we need.” Eventually, this plan helped them to become more successful even though they referred to it as a “development plan” and not a “business plan”. To be honest, I don’t care what they call it, what matters are results. It’s not a problem if those I consult surmise that my ideas are inspired by the business environment. I’m certain that businesses wouldn’t hesitate to adopt our methods to achieve their goals. So why not do the same? — Where should cultural institutions start planning? Then I ask: “What do you mean exactly by ‘success’?” This is much more complex. Because if I come to a cultural organisation and start asking each and every employee individually what his or her definition of success is, one would say “we want international recognition”, another one “we want to work in choreography”, etc. Often, even the members of a single team don’t have a shared vision. It is important to have a clear idea of the future and a shared vision of success. Everybody’s views should converge. If this is achieved, that’s half the battle. Then you need to ask yourself: “What do we have today?” Setting out on a journey, it is necessary to know the final destination and the starting point. Therefore, an objective analysis of advantages and disadvantages is a must. You may lack money, but have a lot of enthusiasm and good international contacts, but no intellectual property. — Exactly. In the end you get a SWOT analysis. Thus, we have to analyse our current status and position in relation to our competitors. Perhaps it’s better not to call them “competitors” as they are our friends and colleagues. But in reality they have set their sights on the same markets, the same funding as we have. We have to clearly recognise what we can offer but they cannot. At this stage it is also important to ask yourself: “What do we do particularly well compared to our competitors?” If an organisation does something well but others do it better, you lose. For example, people say: “We work in documentary film production, but we’re not sure that we’re strong at that.” I ask: “What about the other organisations?” “Oh, they’re doing even worse…” Thus, in comparison with others they have a competitive advantage and then the picture is turned upside down. In addition, the concept of strategic marketing is useful here. Usually, when they hear the word “marketing” people think advertising and promotion of products and services. 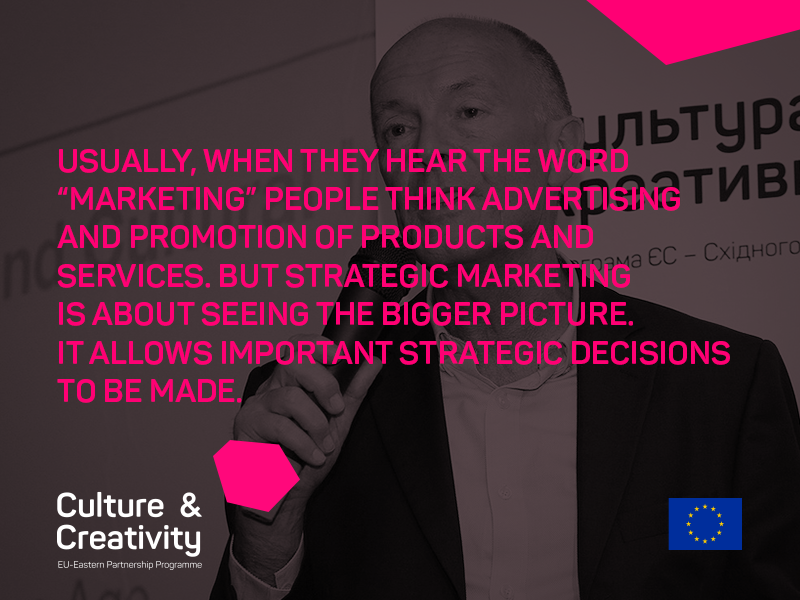 But strategic marketing is about seeing the bigger picture. It allows important strategic decisions to be made. For example, which markets to focus on and which ones not to go for yet. The next important question is: “Who is our main audience? Who needs our product?” Think about who you should sell your product to. Who really needs it? 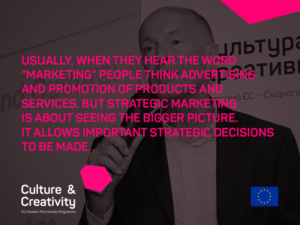 And so the link between the competitive advantage and strategic proactive marketing is in the choice of the most suitable markets. Such an approach gives us a “business formula”, a few key elements that perfectly match and work in harmony. Using this formula, you can determine all the subsequent steps that would lead us from our starting point to our goal. And you may start thinking about specific steps: “OK, it’s time to talk to government officials” or “we have to find funding”. — This is a tactic. — Exactly. It is a matter of tactics. And later it becomes simpler as we’ve already decided on the route, goal, clarified our current position, starting point, chosen the path and worked out a formula for ourselves. And from then on work is fairly easy. People agree: “It’s obvious!” Of course, everything becomes clear once you explain it. But it’s one thing to understand it mentally and another thing to apply it when it’s time for action. As I’ve already mentioned, strategy also includes what you shouldn’t do. —In other words, strategy should be selected from all possible options? But if you focus on twenty-two areas, you can safely say that you’re focusing on none. Decide which two or three strategic goals you should achieve; it’s not easy, but it’s more difficult to give up on the remaining areas even if people rationally understand that this is necessary. Here you need a very high level of self-discipline. Once I was reading a book and came across a quotation by the Chinese Timothy Chan, who was ranked the second richest person in China. He was saying that he admires Bill Gates, the founder of Microsoft, because with his abilities he could have done anything – air freight, manufacture, but he put all his money into developing software. It takes incredible self-discipline to direct all your efforts like a laser beam on one goal. Such an approach is always crowned with success. But most of us do not have such concentration, and the cultural sector is no exception. — How can we make sure that the strategy we devised does not remain ink on paper, how should focus be maintained? Perhaps there are tools for this? That’s how things work in life too. You may want to learn languages, travel around the world, make a career, but alas life is not eternal. The main question is: what would you like to achieve most of all, and why? General Electric created a certain filter, which it called “The main ideas of General Electric”. It was decided that the boss would adopt each and every idea but this new filter would have to be applied to each one first. All ideas were evaluated according to two criteria: “What brings the greatest profit?” and “What can get us to a leading position on the market?” They did not want things that did not contribute to their international primacy. They reasoned in the following way: “Lawn mowers? OK, but will we be able to attain a dominant position on the market? No. Because Humber is already working in that area.” Such an approach gives people the possibility to understand why they are only working in this area, to be focused on the same ideas and to maintain this focus. But the world is forever changing, and any area may lose its relevance, and new ones appear on the horizon. Therefore, we are continually reorganising our activities, but continue to work with just two or three priority areas. You can achieve everything but not all at once. You have to make a choice. If you want to become the world skiing champion, then you will have to give up on dancing and learning languages. No one likes hearing these words because people want easy solutions. — Can this tool be used by any enterprise, even a small cultural organisation? — Of course. It is a good way to focus on the right area. For General Electric it was activities bringing in profit, as it is a commercial business. Even if what matters for us is cultural influence and educating people, this tool works still. — What common mistakes do people make in strategic planning? And which tools can help them to avoid them? 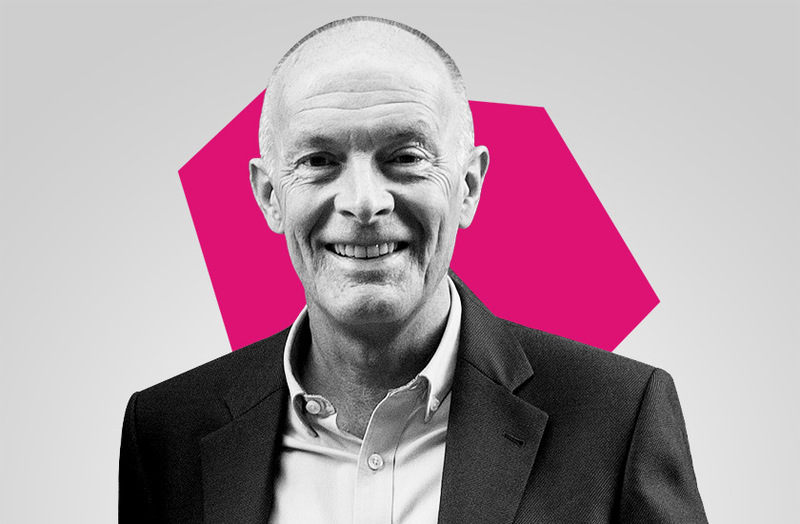 — The number one mistake is that people don’t use strategic planning in their activities in the first place. Another mistake is that people follow others. They reason in the following way: “All dance studios do this, therefore we should do this.” This way you won’t be able to determine what your trump card is. It is convenient to be part of a crowd, but sometimes our dissimilarity from others can be our advantage. It’s better to reason like so: “All dance studios do this, what can we do that they don’t? For example, begin teaching this form of dancing.” The study of your distinctive features is not always comfortable from an emotional point of view, but is rational from a strategic viewpoint. We shouldn’t ignore how the market perceives us. That you’re a specialist in 17 different areas might be absolutely true, but the market won’t believe it. Therefore, we have to show the market clarity by being an expert in one field. Ten years ago I had a website, the website of David Parrish, expert in international management in the field of creative industries, humanities, philanthropy, hotel business, etc. I wanted to work in all areas. But then I looked at my work through the eyes of the consumer, and decided to use my own methods. I asked myself: “In which of these areas would I be able to attain the best results and surpass my competitors?” I could have become an expert in the hotel business, but in that area there are hundreds of other experts who are better than me. Whereas in the field of creative industries I could be a big fish in a small pond. I created a new website. The old one had thirteen different areas. The new one has just one: creative industries. One fine day, I pressed the button and deleted the old website once and for all. It was very difficult emotionally. People said that I was foolish, that I won’t have any work now… You know, we have to accept that. We’re not robots, besides intellect we have emotions. Making certain decisions is daunting, isn’t it? Naturally, but you still have to do it. But once you make the right decision, it’s no longer that daunting to press the button and burn old bridges. — How has, in your opinion, the concept of culture changed in recent years? What are the main trends in the world in the cultural and creative fields, and what will these fields look like in the near future? Are they going to experience any fundamental changes? — I think that the word “culture” means different things to different people, and in different countries the meaning invested into this concept may be quite different. But overall, I believe that the word was earlier associated with “higher culture”, such as classical literature, opera, ballet, visual arts. The modern concept of culture and the meaning of this concept now also covers “mass culture”, including, for example, rock music, film, photography, graffiti among others. I think that this “shift” has, to a large extent, taken place in the US and Western European countries. In Russia and other post-Soviet societies it is felt to a lesser degree. — What do countries need for the effective development of their culture? Is there some universal recipe, or list of necessary requirements, for this? — The answer to this question depends on what you mean by the concept of “culture” in every individual country. Nevertheless, I’m certain that the word “culture” is associated today with an ever-broader view of the cultural sphere, including popular cultures and not the exclusive field of “high culture”. In this context, I would like to say that wider access of the whole population to culture is the most important factor. This includes not only passive consumption of culture, but also the possibility of being involved and directly participating in the creation of culture. This is, of course, highly unlikely in opera, ballet and similar forms of art, but, on the other hand, with the help of new technologies, more and more people have access to photography, video, writing and publishing texts, music, etc. This is happening because mobile phones and the Internet make it possible for an increasingly larger number of people to be not merely consumers, but also creators, of culture. — Culture and business are often set against each other. In your view, can culture be a business? What place can culture occupy in the economy of any country? — Of course it can! Culture and business shouldn’t be mutually exclusive concepts. Moreover, culture and business can work together harmoniously. It is precisely this idea that is the basis for my book “T-Shirts and Suits”. For example, William Shakespeare was not only a poet and a playwright but also a businessman. Popular culture is very much about business. Take Hollywood for example, or the rock music industry or book publishing, etc. 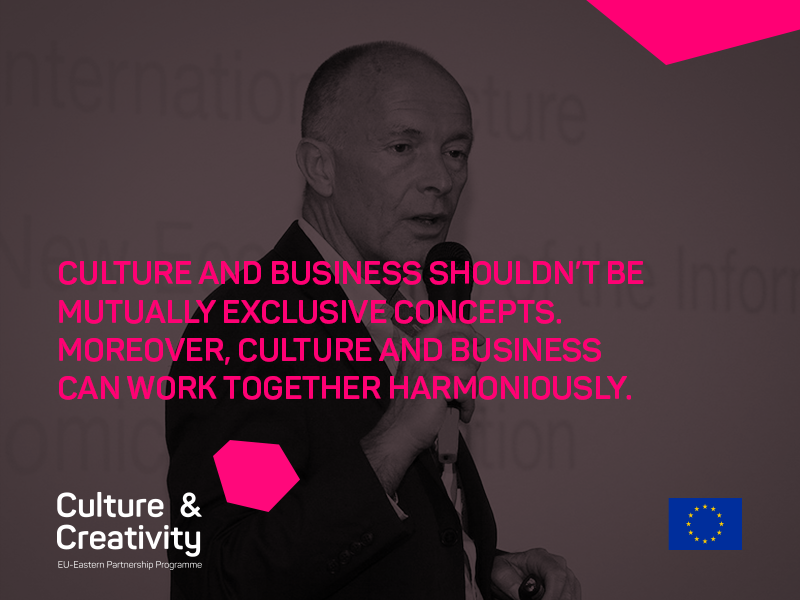 Culture and creative industries can have a great impact on a country’s economy. For example, they make up 8% of GDP in the UK. — In your view, what can make Ukraine unique among the other countries of Europe? How should we use our potential? — Each country should develop its culture and economy in its own way, develop its own talents, traditions, culture and infrastructure. This is often what sets a country apart from its neighbours, gives it a competitive edge. This always works the same way in the economy, but this is equally true of culture. Therefore, Ukraine should decide what its strengths are in comparison with other European countries and use these assets to move forward. —What kind of help and support do you think Ukrainian institutions in the cultural and creative sphere need most? — I think that the cultural and creative sector needs an explanation of how to join their scope of activities with entrepreneurship. They have to learn about business methods that they could use and adapt to their own values and goals. For example, I was in Ukraine, Belarus, Georgia and Azerbaijan for seminars on matters of strategic planning for cultural and creative leaders. After all, methods used by commercial organisations can be beneficially adapted to the needs of the cultural sector. — Ukrainian culture has long existed in certain opposition to officials, without any form of open dialogue and real support. What is the best way to create productive dialogue between culture and government officials, NGOs and civil society? — The battle between the so-called “bottom-up” and “top-down” approaches to culture will always exist. In the past, the state’s “top-down” approach was more powerful. In recent years in Ukraine, the “bottom-up” approach has become more powerful on the part of the people. Productive dialogue will continue in the form of a negotiation process or even, to some extent, in the fight for power. On the other hand, aspects of culture that do not need state sponsorship, and those aspects that cannot be controlled by the government, will develop rapidly as they don’t need negotiations. Therefore, progress will be faster in these areas of culture. “Culture matters” is a joint initiative by Platfor.ma and the EU-EaP Culture and Creativity Programme. This David Parrish interview was given as part of David’s work with the The EU-Eastern Partnership Culture and Creativity Programme. 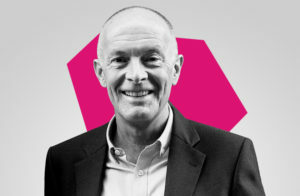 David designed and delivered training workshops and online courses on strategic planning and marketing for cultural and creative entrepreneurs.